Fried pastry with peas and spices and a choice of seasoned beef or potato filling. Served with our homemade sauce. Homemade hummus served with fresh house baked naan. Mouth watering potato curry, made with special spices and served with homemade sauce. Garbanzo beans cooked in Afghan spices and fresh tomato sauce. Baby spinach with sauteed onions, garlic and black pepper. Pan fried baked baby pumpkin, seasoned with brown sugar, served on garlic yogurt sauce and topped with ground beef. Pan fried eggplant seasoned with fresh tomatoes and green peppers. Served on garlic yogurt sauce. Specially fried pastries filled with seasoned potatoes, garlic and cilantro and served with special chutney sauce. Ravioli filled with scallions, served with garlic and mint-yogurt, topped with ground beef. Mixed greens, lettuce, baby spinach, tomatoes and cucumbers topped with house ranch or balsamic vinaigrette dressing. Afghan style mixed greens, tomatoes, red onions topped with lemon juice. Mixed greens, basmati rice, eggplant dip, hummus, baby spinach, salad, sweet corn, topped with lemon herb tahim, garlic yogurt, cucumber sauce. Choice of beef or chicken patty, 100% house made seasoned with blend of spices. Served with French fries. Marinated steak, served with chopped salad and wrapped in fresh house baked naan. Served with French fries. Sliced marinated lamb in a fresh naan with chopped salad and topped with homemade spices. Served with French fries. Wrapped in fresh naan with a spread of hummus, eggplant dip, fresh salad and dressed with lemon herb tahnini sauce. Served with French fries. Marinated lean chicken breast kabob and served with chopped salad wrapped in fresh house baked naan. Served with French fries. Mildly seasoned ground beef and served with chopped salad wrapped in fresh house baked naan. Served with French fries. Tender pieces of chicken marinated in our sour cream butter sauce, with ginger, garlic and fresh coriander leaves. Thigh meat marinated in lemon pepper, jalapenos, cilantro and garlic. Marinated sliced lamb, served on top of basmati rice, topped with tzatziki and gyro sauce. Served with hummus and French fries. Consists of falafel, hummus, afghan salad, Kabuli rice and tandoori naan. Seasoned ground chicken mixed with cheese and mix spices. Afghan ravioli filled with leeks, served on minted yogurt and topped with yellow split peas and light tomato sauce. Served with pollow rice. 2 pieces of pan fried ground beef marinated in fresh grated spices. Dark meat chicken on the bone marinated in tandoori seasoning. Marinated tender chicken cubes served on house salad with our homemade balsamic vinaigrette dressing. 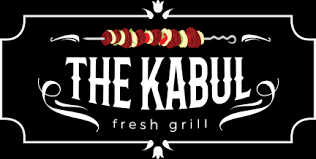 Jumbo shrimp marinated in an exotic blend of atghan spices cooked on skewers in the tandoor. 3 pieces of marinated baby lamb chops. Fresh salmon fillet marinated in our house special seasonings, served with sabzi and long grain white rice. 2 skewers of seasoned ground beef. Marinated chunks of boneless beef. Marinated boneless chunks of lamb. Marinated boneless chunks of chicken. Jumbo shrimp cooked with spices and butter sauce. Chicken breast tenders marinated in spice and yogurt, baked in a tandoor oven and cooked in a tomato based creamy sauce. Delicious ice cream flavored afghan style dried fig, almonds and cardamom. Afghan style rice pudding, topped with cardamom and roasted.